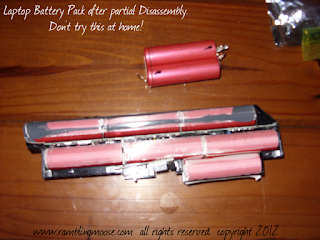 Even once you have taken these things apart, you must, MUST charge the batteries in a charger that is specifically designed for the purpose. If you charge the batteries in an unapproved manner by using too much voltage or too much current you'll have that list above to contend with. As the video at the end of the article shows, they do explode. Really these are dangerous objects. Be careful. On the other hand, if you are using a laptop, chances are you had one sitting on your leg or your belly safely. You just didn't try to puncture the thing. Laptop Batteries are a strange beast. They come in a couple different types. I've seen "Flat" batteries like the one in your cell phone, and I've seen ones that look like a AA battery on steroids. Those are 18650 batteries. The laptop I am using uses six of those cells in series to power the machine for 3 hours. The reason I looked into all this weird danger is that I have a flashlight that I depend on. It puts out as much light as a 75 watt light bulb in a very tight beam - 1200 Lumens. With a 18650 instead of the 3 AAA battery pack, it throws more light. This light is really more than anyone needs to follow a dog at night, but when you live in an area with power pops, blackouts, hurricanes, and other strange events, you need a bright light. Since the 18650 is rechargeable, I can relax about waste and pollution and so forth. The battery pack you see in the picture has 7 of those batteries. One was dead. They normally do that after around 1 year of regular use so I thought to take it outside and disassemble it. They were taped together and glued in place. It all came apart with a little bit of wrangling. The laptop battery packs will cost you around $90, and with these batteries, I can "refurbish" mine once it finally goes to the land of "15 minutes between charges" by finding the bad cell and replacing it. After cutting the leads between the wires to separate them, I was able to charge all but one. With those six, I was able to replace the batteries in a number of appliances and put them back to use. Since each battery costs between $5 and $25, there was a significant cost savings. As for charging, the charger was put on a long extension cord out to the cement patio and each battery was charged once to see if they "took a charge". They did with a few that were dead..
That flashlight? Oh it's much brighter than the little AAA Battery pack could have managed. Strange weekend project but successful. Just remember, Don't Try This At Home, and if you insist, forget you read about it here! The video below is more proof that this is not quite safe. Youtube is chock full of videos of people doing stupid things to these batteries like burning them or overcharging them. This is the result. That result is why I went to the extremes of doing it outdoors, charging the batteries outdoors and so forth. You just never know if you get the bad battery and you're having a bad luck day. Be safe and take precautions.